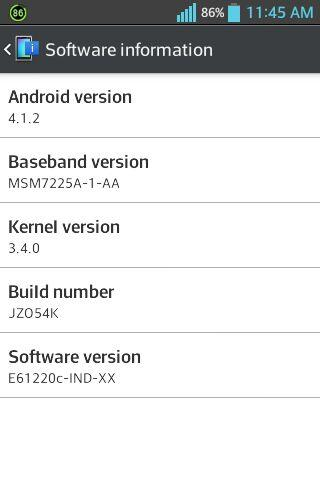 The LG Optimus L7 got the Android 4.1 update in India back in May, now LG has started rolling out the Android 4.1.2 (Jelly Bean) update for the Optimus L5 (E612) users in India. The Optimus L5 was announced back in February 2012 and released in India last June. The software version is JZO54K similar to the other countries and the software version is V20c. All the L Series II devices that were launched recently run on Android 4.1 (Jelly Bean) out of the box. LG announced the Android 4.1 (Jelly Bean) update schedule for high-end devices in Korea last year. The Optimus 4X HD got the update in Europe last month and the Optimus L9 got the Android 4.1 update in India recently. The Jelly Bean update for the Optimus L5 would bring better browser, better notifications, Google Now and several UI enhancements. The Android 4.1.2 Jelly Bean update for the Optimus L5 is available through the LG PC Suite and is about 370 MB.